Dr. Uzzle was born in upstate New York, moved to Virginia at the age of 14 and now considers Virginia his home. His love for animals and interest in veterinary medicine began through the personal experiences he had with his own pets. Seeing the care and compassion that veterinarians displayed for his animals made him want to do the same for others. 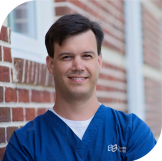 Dr. Uzzle graduated with honors from Virginia-Maryland Regional College of Veterinary Medicine in 1998 and was in private practice in the area until 2008 when he joined the BAVI team. He was recruited by BAVI because of his thoroughness and attention to detail. With cross-disciplinary clinical interests including cardiology, neurology, anesthesia, pain management and advanced imaging, he was ideal for BAVI. Dr. Uzzle works very closely with area family veterinarians, specialists and the neurologists at The LifeCentre & The Regional Veterinary Referral Center. He has formed many strong relationships with internists, criticalists and anesthesiogists over the years. He is committed to the advancement of veterinary medicine and passionate about helping people and animals by obtaining diagnoses through advanced imaging. Finally, he is charismatic and a great leader of the BAVI team. Katie joined the BAVI team in August 2011 and has exceeded our expectations with every task we have challenged her with. She graduated from Virginia Commonwealth University with a BS in Biomedical Engineering in 2003. In addition, she has over ten years of experience in veterinary medicine. Because of her passion for animals, she ultimately chose veterinary technology as her profession, obtaining her license in 2009 from Penn Foster College. Her experience in veterinary medicine includes: general practice, surgical nursing, anesthesia, and emergency medicine. She has strong interests in diagnostic imaging, anesthesia, pain management, and surgery. The challenges of diagnostic imaging and anesthesia make her an excellent fit for BAVI. Outside of work she enjoys spending time on her farm with her husband and numerous animals. Her favorite hobby is caring for, riding, and competing with her horses. Lauren's love for animals started at an early age and she would like to think she inherited that love from her father. They used take in any stray they found and do whatever they could to give it a loving home. At the age of 14 she started volunteering at animal shelters which led her to the field of Veterinary Medicine. She is currently in school to become a veterinary technician. When she is not working, she is either spending time with her family including a furry motley crew, or trying to find some sort of fun activity to partake in. 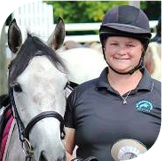 Megan grew up in Southern Pennsylvania and pursued an education in Veterinary Medical Technology from Wilson College. She graduated in 2007 with her bachelor’s degree and became licensed in the State of Pennsylvania later that year after passing her VTNE. She worked in general practice, first as a licensed tech and then as a lead technician in Shippensburg Pennsylvania for 6 years. She then moved to Williamsport MD, and worked at an ER practice overnight in Frederick, MD for 10 months, where she was lead of her shift. After deciding she would like to go back to day shift, she began working at BAVI in May of 2014 first in anesthesia and then scanning. When the lead for the Leesburg location left in September of 2014, Megan took over the lead role. She still currently resides in Williamsport, MD with her GSMD Kiah, Lab Kinzye, Pug Cici, tortoise Desmond, and two cats- Sherman and Bella. 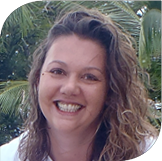 Dawna joined the BAVI team in December of 2011 with 12 years experience as a Licensed Veterinary Technician. She grew up in Las Vegas, NV and moved to the east coast in 2007. Despite the culture shock and difficulty adjusting to humidity, Dawna enjoys all that the DC area has to offer. She loves working with and helping animals everyday and shares her home with multiple pets including cats, dogs, guinea pigs and rats. Alishia grew up in the Central Coast of California. She graduated in 2001 with a degree in Veterinary Technology and became a Licensed Veterinary Technician in California. 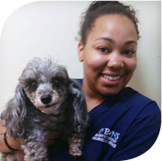 She began her career as a veterinary technician in Shelter Medicine at the San Francisco SPCA, where she worked for 9 years before moving to Maryland in 2010. 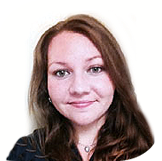 Shortly after moving to Maryland, she began working at BVNS then moved on to work with BAVI. In her spare time she enjoys bike riding at the C & O Canal and spending quality time with her daughter. She also shares her home with her three cats Olive, Mister Beans, and Cheddar, and her Corgi, Tommy. 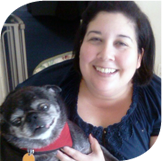 Hannah has been in the veterinary field for over 16 years. She has been with BVNS for 8 years before being hired on at BAVI in 2015. She has previous experience in critical care, anesthesia, neurology and surgery. Her professional interests include MRI, Neurology, anesthesia and critical care. She grew up in Frederick, MD where she still lives with her husband, two cats, 3 dogs, chinchilla, 2 ducks and 12 chickens. While not at work, she enjoys reading, gardening and fishing and kayaking with her husband. 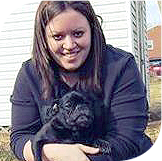 Brittany went to Morehead State University in Morehead, Kentucky where she received her BS in Veterinary Technology. She worked in Veterinary General Practice for 5 years before accepting a position at Bush Veterinary Neurology Service as an LVT. Just one year later she took interest to MRI studies and thereafter, she earned RVMRI. Brittany was offered a position at BAVI and has been enjoying her work ever since! Her passion for education is evident today as she is working towards becoming a VTS in Neurology! When not in the office, you can find Brittany enjoying a Green Bay Packers game as well as visiting family and friends in her hometown in Indiana and Woodbridge, VA.
Cara Scarano is a Licensed Veterinary Technician and recent addition to our Springfield team. Cara graduated from in NVCC in 2010 and comes to us from Great Falls Animal Hospital. When not in the office, she enjoys traveling with her husband and hiking with her dog, Chester. She also shares her home and heart with 2 cats, Rod & Todd.